Two years ago, my husband and I became homeowners. As many homeowners can attest to, this very “adult” milestone has been equal parts exciting and frustrating. We’ve gradually remodeled rooms, discovering an array of cut corners and wonky design elements along the way. Our most recent project was totally redoing the downstairs bathroom. It seemed simple enough. Just a small bathroom, I thought…how hard could it be? Ah, the naivete. The original bathroom was functional and well laid out, but seriously needed a style update. Pink granite countertops and an abundance of beige tile made for a dated look that didn’t flow with of the rest of the first floor. Our contractor gutted the whole thing and we started from scratch. We wanted to keep this project around 10K, but with the additional costs of wallpaper installation and needing to replace the toilet, we ended up over budget. Fortunately, since this was our only big home project of 2018, we had some flexibility. I was also able to save some money by using extra tiles we had from the previous year’s kitchen remodel. The starting point was the wallpaper. I wanted to use Botanica for this room, and the dark gray hexagon tiles for the floor (leftover from our kitchen remodel) worked great with the colors in this design. I envisioned mostly black, white, and gray design elements, but wanted to add a pop of blue to bring out the blue tones in the wallpaper. Tile: I spent nearly half a day at All Natural Stone. It was somewhat exhausting but time well spent because I found the PERFECT turquoise and gray oversized tile for the back wall of the shower. I chose large white subway tiles for the sides of the shower to draw the eye back to the focal accent wall. Lighting: After hours of scouring every online resource I could think of, I finally found our modern, geometric sconces from 1800Lighting. 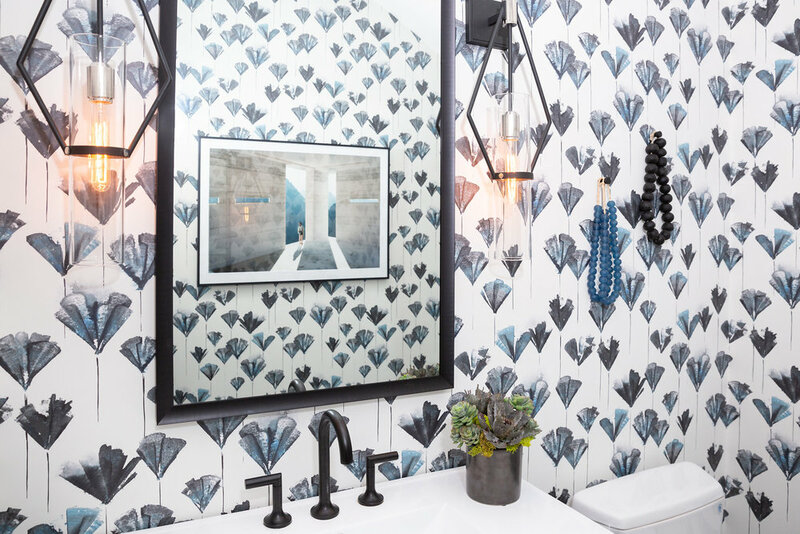 Vanity: I wanted a simple black vanity and found one I liked at Ferguson. Solid maple and made in the USA. Hardware: I was set on matte black, and found some very cool options from the Jason Wu collection for Brizo. Not having a downstairs bathroom for two months! Also…this project gave me a whole new level of appreciation for interior designers and ALL the decisions they have to make. On multiple occasions, I felt completely overwhelmed with decisions for this tiny space. The messy work was done, but the bathroom needed some finishing touches to soften the space. I had been looking for an excuse to invest in photographer Ilka Kramer’s work for while, and this serene piece fit the bill. It was a big purchase, but the large print really makes the room! I love how it reflects in the mirror and allows the eye to take a break from the patterned walls. African glass bead strands add some depth and warmth to the room, and I like how their subtle imperfections echo the wabi-sabi quality of my wallpaper design. A ceramic planter with succulents adds a lovely pop of green. Lastly, we had a functional need - a step stool for our growing toddler! There are many ugly options out there, but with persistence, I found a much prettier option from Serena & Lily. I’m obsessed with our new bathroom. It is definitely one of the prettiest rooms in the house, and I feel particularly proud of it because I chose EVERY. SINGLE. DETAIL. But it was no joke, and I can’t say I am jumping to remodel our upstairs bathrooms anytime soon.